Although post-traumatic intracranial cysts are relatively rare lesions, the literature pertaining to these entities is quite extensive. Its value is somewhat limited, however, by the use of a multitude of different terms to describe the same pathological process. The embodiment of a hypothetical concept of pathogenesis in a particular descriptive term has frequently been a confusing influence and although custom appears to have justified certain usages, it has frequently been at the expense of clear understanding. 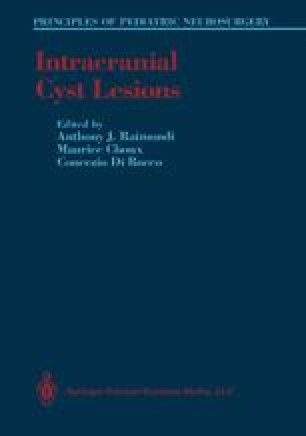 For the purposes of this chapter a cyst is defined as a fluid-filled space surrounded by a membrane. The most generally accepted terminology will be used for each cyst type.